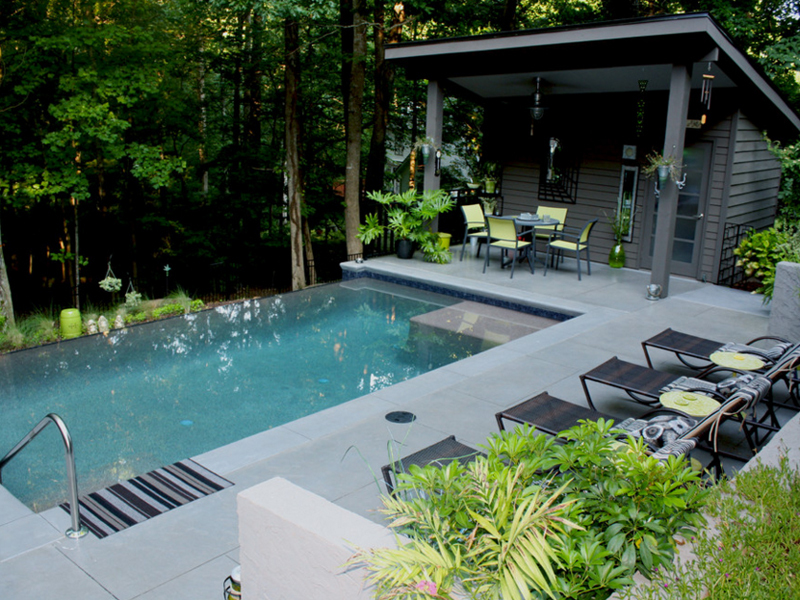 Take a look at this round-up where black chairs are added to the pool deck. Like an Adam Levine song, today’s list will comprise of breathtaking examples. Our list will circulate around black pool chairs that are the most common choice when it comes to pool chairs because of how easy it is to manage and maintain. The materials used with the chairs vary – but you might notice a couple of contending materials because it is just the favorite choice – example of which is rattan and stainless steel. The 20 Breathtaking Black Pool Chairs not only stands out in the pictures that they belong in and in the outdoor where they were situated, but they also add sophistication and class to each of this outdoor spaces. The swimming pools in this list also come in different shapes and sizes and I think that they are all wonderful things that we should be thankful for, especially if you have them at home! Check out the list below and tell us what you think! 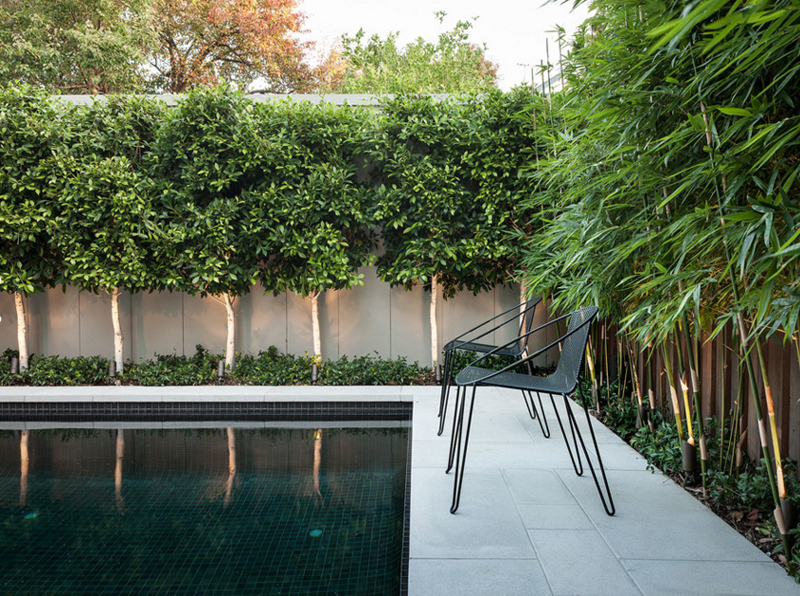 The sleek and slender design of this black pool chairs are really cool. In today’s pool chair designs, or chair design in general – it is uncommon for us to see slender chairs like this one because most of the time, designers create chairs that would fit all sizes and choosing to create a slender one may sometimes may be not the best call; but all in all, I think these chairs are awesome. 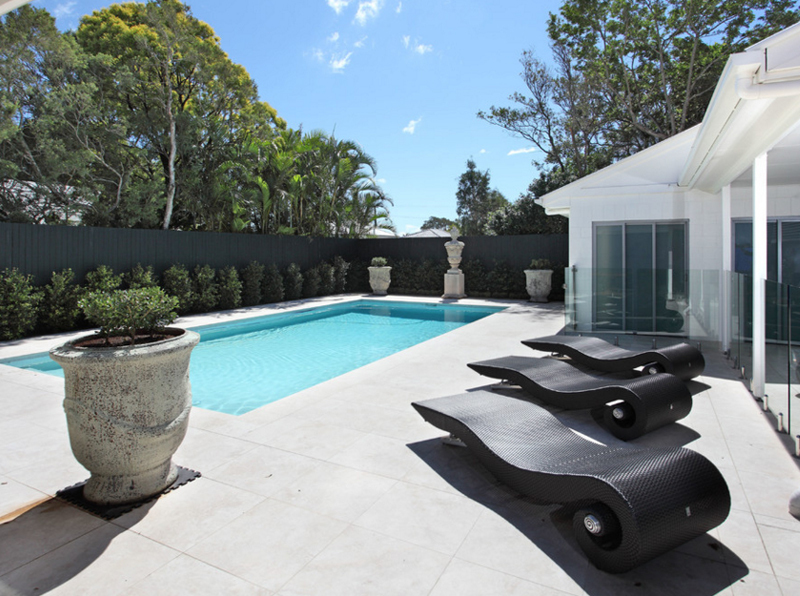 These black pool chairs seen in this Brisbane home is a bit similar to the before it, only this time the design was made more thicker than the last one and showcases more curves. 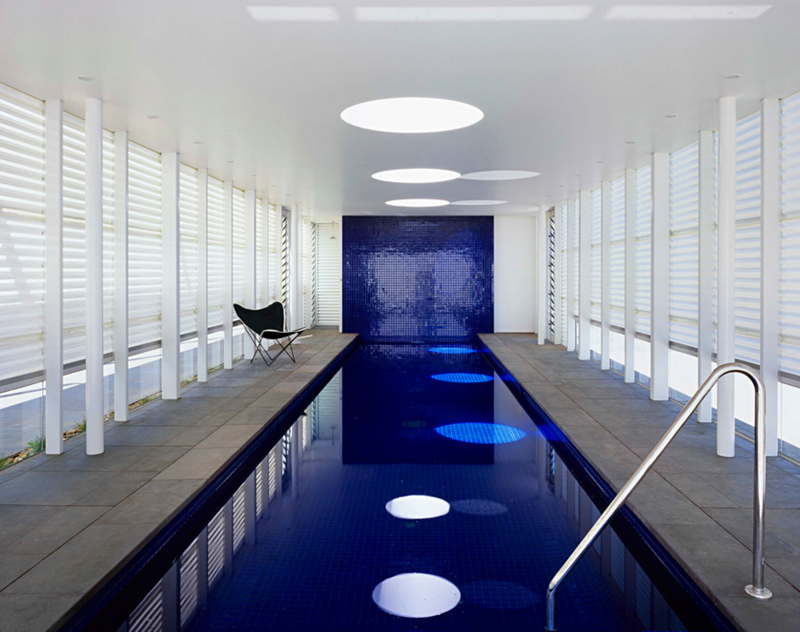 In a space like this one where majority of its surroundings are in white, the black pool chairs was the best option. As we see online and in most home design magazines, the best pool chair material chosen by the designers and the home owners are made from rattan. Not only is it wear and tear resistance, but it is seasoned well to be under high heat regularly and still function longer than most materials out there. So, when we talk about pool chairs, these types are not the most common since people expect to see lounge chairs when they go outside and go for a swim. From time to time though, we need chairs like these ones because we just merely need a place to sit while we sip our cocktails. Here is another example of sitting wherein we see two different sets of pool chairs – one pair are those rattan lounge chairs that look so comfortable you can just sleep in there and the other pair is that of the two black pool chairs which has a beautiful circular coffee table. 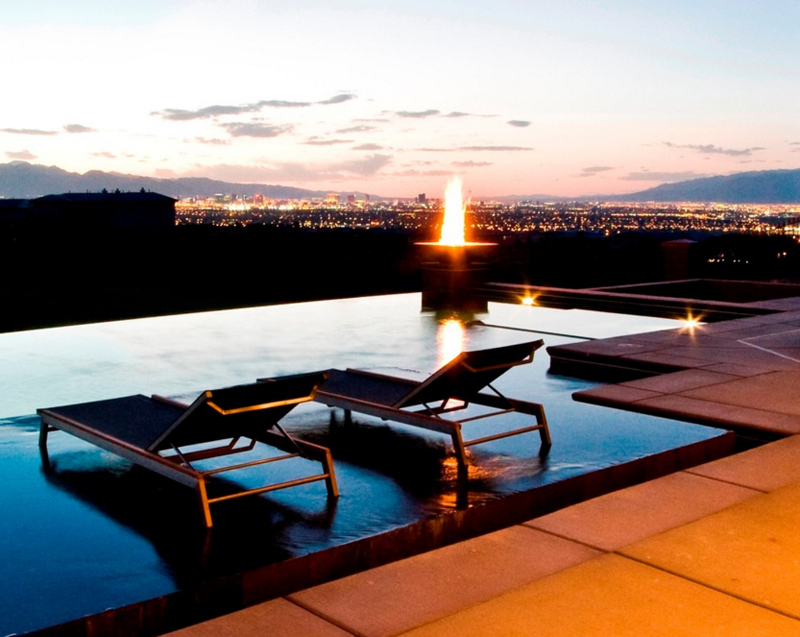 The color of the pool and the candles in this pool sure looks dramatic and expensive! Planning on inviting friends for some barbecue and beer? This outdoor area just looks like the best place to do those barbecues and long talks. 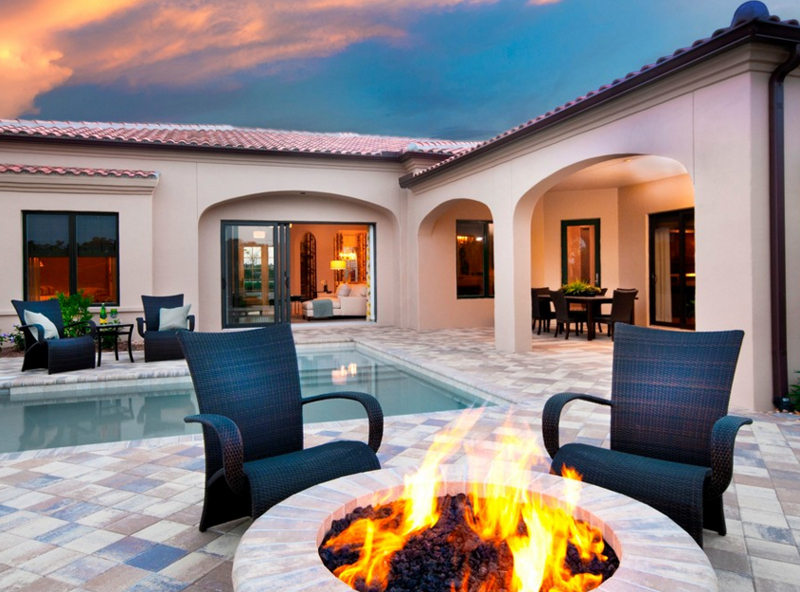 With a contemporary fireplace by the pool along with the chairs, what can be more comfortable than this? What a large swimming pool! I mean, the size of the pool in itself seems like it can carry the entire house in it! 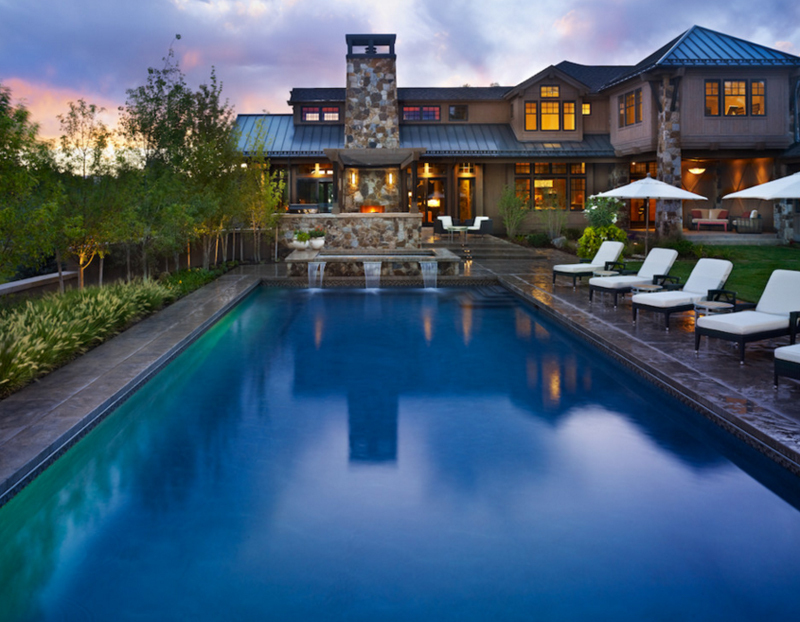 With a cute waterfall at the edge of the pool, this is one Western home that sure is lovely and welcoming. Adding a couple of pool chairs on the side allow people to definitely hang out and chill. A swimming pool that has a lot of seating like this one sure means that it has a couple of people who swims in there regularly – whether family or friends. If you have a swimming pool at home, I think you’d love to have people around for pool parties, right? Now these chairs I love! The design of this black pool chairs sure looks contemporary enough but still almost modern that it can be as appealing as your regular pool chair. It somehow looks really simple but because of the curves and its material – it looks rather stunning! From this angle, it seems like this swimming pool is smaller than your usual family-sized pool; but just the idea that this pool looks like it’s in the middle of nowhere is already a plus – this is whether or not this pool is large enough to cater to 15-20 of your friends! Hunting games amongst the trees will surely be a cool thing to do in here. Let the Hunger Games begin! 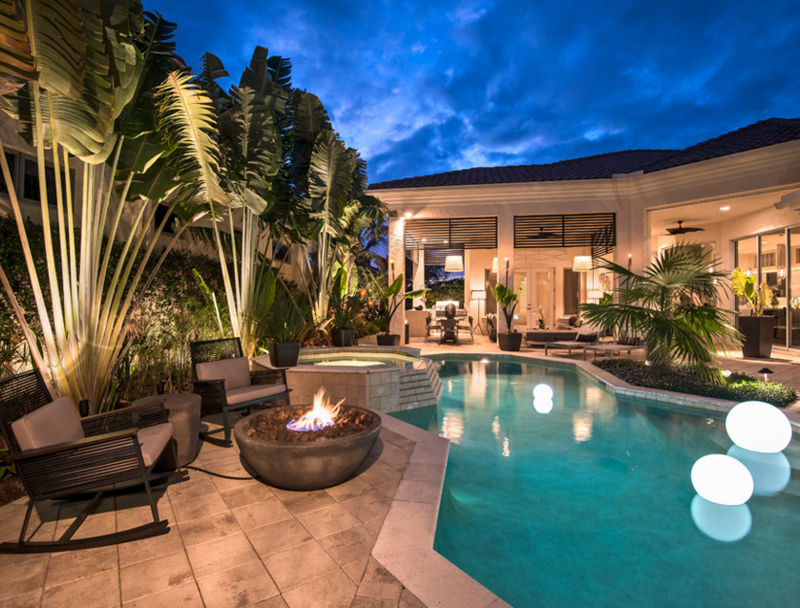 Just look at how large this outdoor area is! I would like to believe that this could pass for an Olympic pool or something! The color of the tiles and large fields in here is just stunning! And because there is in fact a lot space in here – both by the pool area and beyond, adding seating is always a great idea; both to enjoy the pool and the outdoors. I know that it rare that we see indoor pools – especially on this list, but I still wanted for you to see the wonder of this gorgeous pool and the lovely white and blue color palette that it is using. The lone black chair by the left side is a good thing – adding chairs like that could mean at least someone can watch you while you do your rounds. Barbara Rooch Interior Environments, Inc. The large plants around this swimming pool are quite a treat! It feels like this place would have tons of luaus because of how fun and festive these plants are! 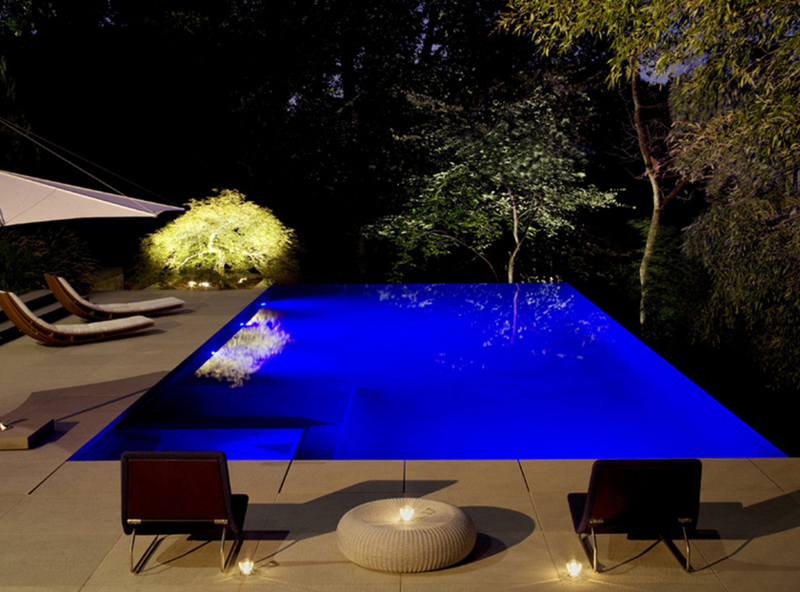 Even the addition of lights in the middle of the swimming pool seems like a great idea for a party! In my area, the public pools do not really have plants or tall and large grasses like this one – but we do have a pools that are sub-divided into a different portions like the ones for the kids and toddlers, for the teens and for the adults. If you notice, the pool chairs in here looks really inviting – what do you think? Are you going to give in? The seating area by the swimming pool is a nice place to sit and sip your drinks, also, this is one place where you can put your gadgets while you are swimming. The black and red combination of the furniture is quite nice because of how much classy it looks without the hassle of too much maintenance. 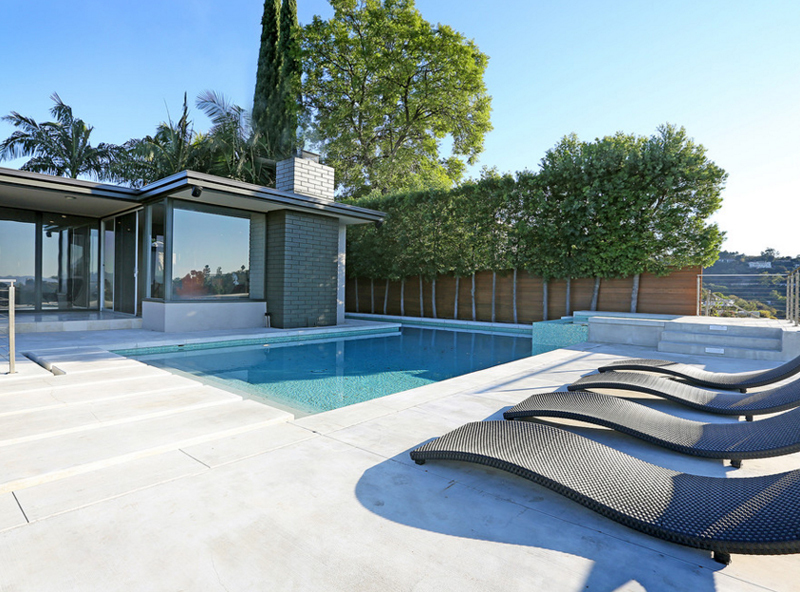 I know that the pool chairs in this list is rather far, but you can clearly see that they are black and they add sophistication to this outdoor space. All the greens in here complement the blue pool and the black pool chairs. Bad lighting? Or is it the contrast of the fire pit and the color of the sunset? This is one space that I know people would love to be in especially after work and before the night really starts to kick in – this is where you want to relax and unwind from a long day’s work. Oh I would definitely love to have this much greens around my outdoor pool. Haha! Of course that’s just merely a thought if ever my parents decide to have one done in our house. The rattan black pool chairs in here is adorned with red umbrellas – something that always goes well together. What a beauty! It’s like this pool connects to the sea to the sky! This majestic color blue is just something that anyone would love – especially those yappies who always want the best of life. That’s a complement of course; and very positive. The stone wall around this swimming pool is really beautiful – it contrasts with the color of wood used for the door. The colors of the leaves of the trees add a hint of color in here since all that there is are greens, browns and blues – well, and black too; the black chairs and the black umbrella too! 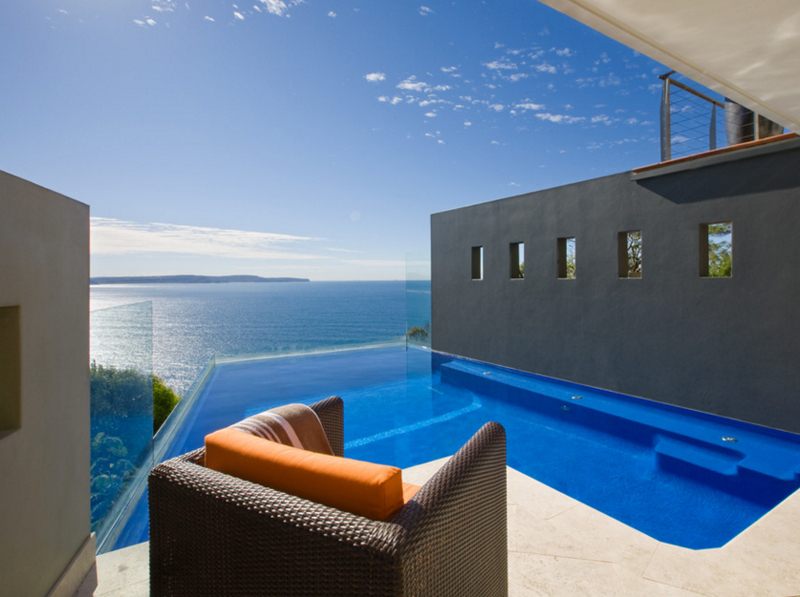 If you liked the pool lounge chairs , I think that you’d love this one too! I mean, why not? The designs of the chairs are really nice, the color is ideal for outdoors and obviously, the materials used on them are perfect for the wear and tear due to the weather. 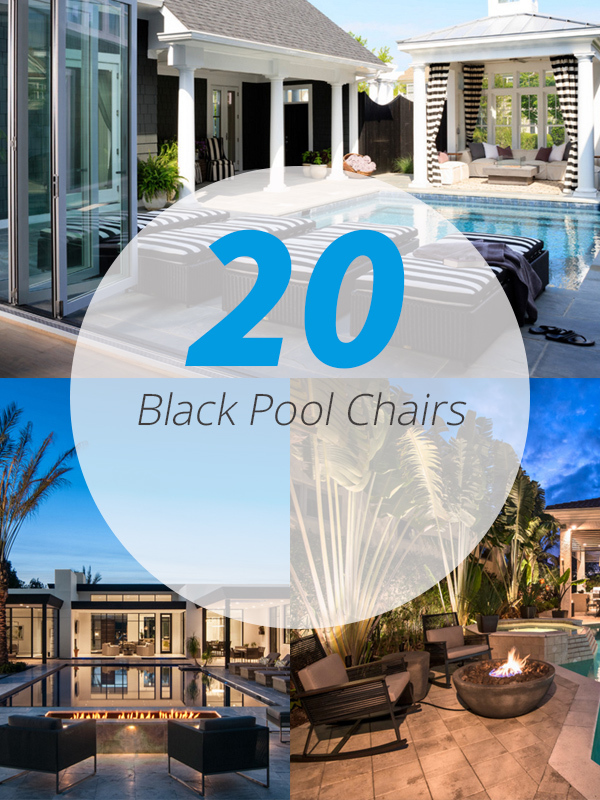 Well, there you have it guys, the 20 Breathtaking Black Pool Chairs – hope you liked it!